Lock in a great price for Holiday Inn Berlin Airport - Conference Centre – rated 8.2 by recent guests! Excellent place, spacious room with really comfortable bed. Friendly staff and convinient airport shuttle bus. It was only for one night but i will highly recommend this hotel for anyone! The room was large and bed comfortable. Nice decoration in bed and bath. The free shuttle from the train station to the hotel was excellent. The food was delicious and the bed was very comfortable. Great for easy overnight. The location was a little far from the airport so you could not walk there from the airport. The shuttle runs every 1/2 hour but no earlier than 5 am with out a reservation. The shuttle driver was quite unfriendly. The room service was tasty. The window in our room was broken, so the cold air was coming in, not great. But all and all ok for a one night stay. Breakfast buffet was off the hook and made up for the poor service and zero hospitality. Located about 1 km from Berlin Schönefeld Airport. Free shuttle from the hotel to the airport every 30 minutes including night time. Nice hotel restaurant. Good value for the money. Faciluty was in good condition abd it was silent. Holiday Inn Berlin Airport - Conference Centre This rating is a reflection of how the property compares to the industry standard when it comes to price, facilities and services available. It's based on a self-evaluation by the property. Use this rating to help choose your stay! 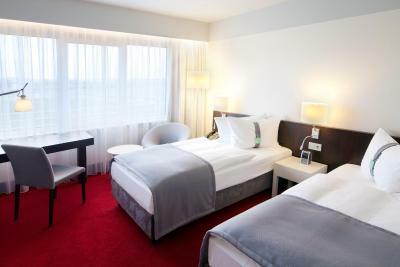 This 4-star hotel offers a free 24-hour shuttle to Berlin Schönefeld Airport, just 1.2 mi away. 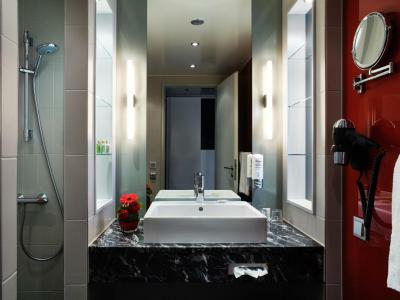 Spacious, soundproofed rooms with flat-screen TV and a top-floor spa are available here. All air-conditioned rooms at the Holiday Inn Berlin Airport - Conference Center feature an Infotainment system, a seating area, and free tea/coffee facilities. Flughafen Schönefeld S-Bahn Train Station is less than 0.6 mi away from the Holiday Inn. The RE7 and RB14 regional train lines run to Alexanderplatz Square in 20 minutes, and the RB19 regional train offers direct connections to Südkreuz, Hauptbahnhof (Berlin Main Station), Gesundbrunnen and Potsdamer Platz in just 28 minutes. This room has air conditioning, complimentary tea/coffee facilities and soundproof windows that open. There is also a flat-screen TV with international channels. House Rules Holiday Inn Berlin Airport - Conference Centre takes special requests – add in the next step!